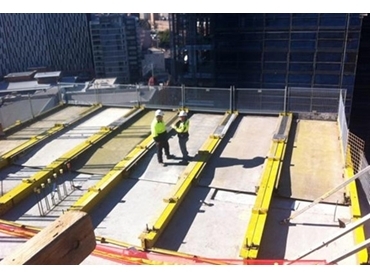 Preston Group combined their loading platforms and barrier fencing products to create an overhead scaffold support system for Watpac for use on the upper levels of the One Central Park development in Central Park, Sydney. With the final stages expected to finish in June 2013, One Central Park is set to become an icon of 21st century living, helping Sydney stake a claim as one of the world’s great urban destinations. Instead of a costly engineered cantilevered steel structure, Watpac sought to install a readymade system capable of delivering an outcome that was safe, less expensive, and installed and dismantled quickly. Preston created an overhead scaffold support system comprising of their cantilevered Superdeck loading platforms stacked side by side to form large decks. Preston Super Barrier fencing was used to provide protection to any live edge exposure. Steve Bowden, Preston Operations Coordinator commented that the Preston loading platform system provided an ‘off-the-shelf solution which allowed for the client to complete their construction works efficiently and at a fraction of the cost that would have been incurred otherwise’. Watpac representatives are satisfied with Preston’s creativity and problem-solving skills in modifying the use of their loading platforms and barrier fencing products.